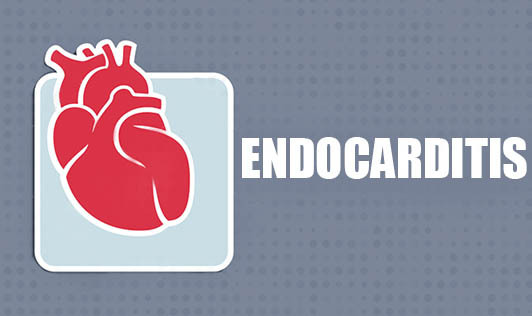 Endocarditis is an infection of the inner lining of one's heart. This occurs when the bacteria or germs from another part of one's body such as the mouth spread through the blood stream and attach to the damaged areas in the heart. Endocarditis is more common in older people, and 50% of all cases occur in patients over the age of 50. Whereas, in children and young adults, most cases of endocarditis occur in those with congenital heart defects. • Everyday oral activities can allow bacteria to enter the bloodstream especially if one's teeth and gums are in poor condition. • An infection or other medical condition such as Gum disease, Intestinal disorder or inflammatory bowel disease. • Dental procedures that include cutting the gums may allow bacteria to enter the bloodstream. • Catheters as well as contaminated needles and syringes are also a concern for people who use Intravenous drugs. If you develop any signs and symptoms of Endocarditis, contact your doctor immediately for an evaluation!